Rock band The Killers are making their Ellen show debut, but they have been making great music for several years now. Ellen introduced them as one of her “all-time favorite bands,” and said that she’d been looking forward to their appearance for ten seasons. Finally, Ellen got her wish when The Killers performed not one, but two songs for the Ellen audience. The Killers performed “Mr. Brightside” for the Ellen audience, a song that’s been around for years now, but still sounds fresh and exciting performed live. The ’80s-influenced, new wave track is a personal favorite, and had the entire Ellen audience singing along. The Killers also performed a new song for the Ellen audience called “Runaways.” The brand new single comes from the band’s latest album, Battle Born, which is their fourth studio album to date. 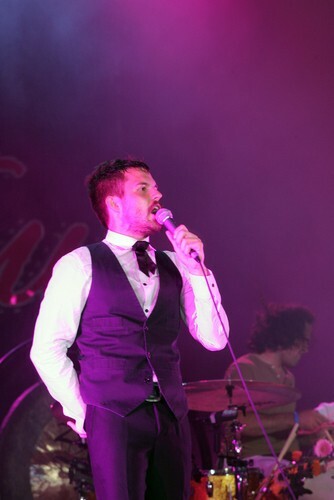 Battle Born was created beginning in May 2011, after a year-and-a-half hiatus in which the band pursued other projects. The album was released on September 18 2012. “Runaways” was also a big hit with the Ellen audience, and the Killers truly brought the house down. It’s safe to say that their very first Ellen appearance was a total hit!